These new headphones are an amazing value and extremely popular. Prior to launching this new product we got many requests for headphones that just block sound. Now we have an incredible, low cost, product that does just that. Released in 2007, the Direct Sound HP-25 headphones use the latest technology in passive hearing protection. These headphones do not have speakers and, therefore, cannot be connected to an audio source. These headphones are ideal for sportsmen or craftsmen where ambient noise levels can be damaging. These headphones may also be helpful for people living with tinnitus or autism. 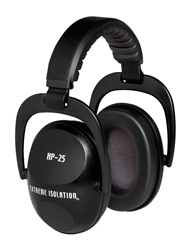 The HP-25 headphones provide 25db of sound isolation which is very helpful for anyone sensitive to loud noises. The headband is adjustable allowing children as young as 4 or 5 years old to be able to use these headphones. The manufacturer provides a 1 year warranty on all of their headphones. The terms are simple. If anything breaks, and it’s not intentional damage, they will fix it for free. After 1 year they still offer low cost replacement parts if you ever need to repair your headphones.